We applaud Bob Huggins' decisiveness to take the mic when his own fans were becoming unruly. "That's stupid!" 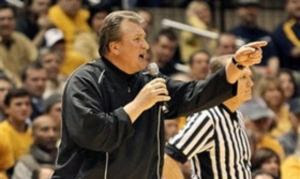 Huggins chided the crowd, urging them to turn in anyone throwing anything onto the floor. The Backyard Brawl, West Virginia's storied rivalry with Pitt often gets chippy to say the least, but when objects come hurtling out of the crowd that's when a stand needed to be taken. Pitt assistant coach Tom Herrion was still hit in the face with a coin. This on the heels of home dates against Ohio State and Louisville, when the West Virginia home crowd made some very unsavory and disrespectful chants. Now hated rival Pitt was in town, and the behavior convergence had reached a boiling point. 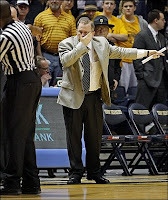 Huggins' words were admirable but not 100% effective. So we at Backtime have crafted a new address to the Mountaineer faithful before Monday's big game at Villanova. I am proud to be a Mountaineer. I have played here, I have coached here and you are the best fans in the world... But there are individuals in this building that give you all a bad name. If any of you see anyone trying to cause harm, I want them out of here. I will take my team off the floor, and we will play the rest of our home games in an empty gym if we have to. This team works like hell to make you proud of them... Make them proud of you.